The sweet mysticism of chanting in the background, the burning incense in the temples and the colourful offerings at every street corner. Whatever time of year you visit Bali, make sure to keep your eyes and ears peeled for ceremonies and rituals. You’d be surprised at how many invitations you may receive to weddings, cremations and dances. The festival of Galungan is celebrated every 210 days and marks the creation of the world as the Balinese know it. As Bali’s major annual event, it celebrates the descent of Balinese gods and ancestors to earth and symbolises the victory of justice and truth over evil. Kuningan, which comes 10 days after Galungan, marks the end of the holiday season with yellow offerings to bid the spirits farewell. Major celebrations are held at the water temple Tampak Siring. Melasti is a religious purification festival, which occurs just before Nyepi and sees villagers dressed in vivid ceremonial clothes making their way to the sea with offerings of fruit and flowers. A sort of exorcism procession takes place with gamelan (a musical instrument) and raucous shouting (the Bhuta Yajna Ritual) to mark the eve of Nyepi, with villagers carrying the ogoh-ogoh (handmade paper mache monsters that represent the evil spirits). Nyepi is a ‘day of silence’, which falls on the day after the new moon around mid-March. Everyone is expected to stay indoors so that the spirits will believe that the island is uninhabited and will not return. Observed for 24 hours, Nyepi is a day reserved for self-reflection and as such, anything that might interfere with that purpose is restricted. The main restrictions are: no lighting fires (and lights must be kept low); no working; no entertainment or pleasure; no traveling; and for some, no talking or eating at all. Most Bali hotels and villas will not accept holiday makers on this day, while no flights will be operating in or out of Denpasar at all. If there were a must-see Balinese ceremony, it would be this. 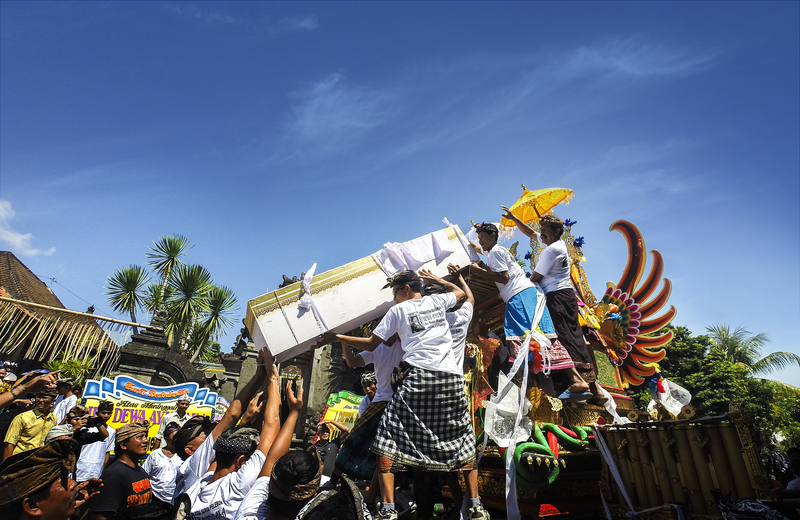 While ceremonies punctuate the lives of the Balinese right from birth, the cremation ceremony or Ngaben of an individual is likely to be the most lavish of all. Usually a body is temporarily buried while relatives save for the outrageous expense. The purification rite sees the body carried from its temporary site to the cremation site in a multi-tiered bamboo tower in the form of a bull, decorated with a dazzling array of silks, mirrors, flowers, tinsel and paper. Photo credits: Main, 1, 2, 3 and 4.